Home Inspector Training - Licensed Home Inspector Training in New York. The purchase of a home is probably the largest single investment you will ever make. We at American Building Inspection and Training Co., Inc. are dedicated to providing you with the information you need to make a sound decision in the home purchasing process. Don't trust your biggest purchase of a lifetime to a company with less experience. We have been in the Home Inspection business since 1984 and have provided home inspector training to Home Inspectors since 1995. We keep up with the latest changes in the Building Codes and will alert you to those issues you should be made aware of for safety. Let our knowledge, training and experience protect Your American Dream. Our Home Inspector Training program is dedicated to passing on the knowledge, experience and passion of our instructors to our students through our 140 hour training program. We are approved by New York State Dept. of State as a qualified training school authorized to provide training and Certification in New York. We are listed with ASHI, NACHI and NAHI as a Home Inspector Training School. You could Learn to become a New York licensed Home Inspector from this Home Inspector training company. 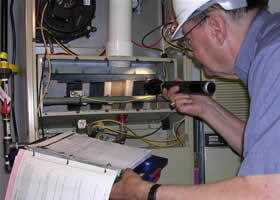 Professional Home Inspector instructors provide all aspects of this Training. Students will receive a copy of the International Residential Code which is used by New York and many other states as the standard for building construction. American Building Inspection and Training Co., Inc.